One of the worst parts of moving is moving couches and other heavy items. This can strain your back and even increase your risk of injury. If you hire a moving company in Philadelphia Pennsylvania, they will do all of the lifting for you. They are trained to lift heavy items like beds and couches without suffering injuries. Your belongings are important to you, and the last thing you want is for them to get damaged during your move. Most moving companies offer insurance with their moving packages. If your items do get damaged during the move, you will be reimbursed for them. Moving on your own can be a very time-consuming process. You have to pack your items, put them into your vehicle, drive to your new house or apartment, and then unpack your belongings. If you have a lot of belongings, you will likely have to take several trips. However, if you hire a moving company Philadelphia PA clients respect, the movers can move all of your items in a timely manner. No matter how many times you have done it in the past, moving is a stressful process. You have so much on your plate, including cleaning your house and sorting out your bills. Having to transport your belongings to your new home will just add to the stress. If you hire a moving company Philadelphia PA residents depend on, movers will do all the moving for so that you can have some relief. Another benefit of hiring a Philadelphia moving company is that you can rely on them. You can count on the movers to be at your home when they say they will. If you were to ask your friends or family to help you move, there is no guarantee that they will show up when you need them to. Certain equipment is needed to make the moving process as simple as possible. Most people do not have this kind of equipment at home. If you hire a moving company Philadelphia PA families count on, you will know they have the proper equipment, such as ramps and dollies, to make moving simple. 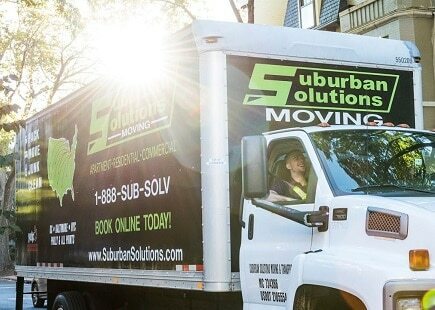 At Suburban Solutions, we understand how overwhelming moving can be and offer our assistance. With our reliable movers on your side, you will have a peace of mind when you move to your new place. If you are looking for a moving company Philadelphia PA locals rely on, you may want to contact Suburban Solutions at 1-888-SUB-SOLV.